Our Teachers: Father Calinic Berger, Ph.D.
Father Calinic was born in Detroit, Michigan and baptized by his maternal grandfather at the St. Simion Romanian Orthodox Church. In 1969 his family moved to California. As a child and as a teen he attended the Orthodox Church of the Redeemer in Los Altos Hills, California where he formed the desire to serve God as a priest. Having graduated from Santa Clara University in 1988 with a bachelor’s degree in Electrical Engineering, he later enrolled in the Holy Cross Greek Orthodox School of Theology, graduating in 1994. Following seminary, he enrolled in the doctoral program in Patristics and Historical Theology at the Catholic University of America in Washington, DC, completing his Ph.D. in 1in 2003. In between and during his theological studies, he worked as an electrical engineer in the semiconductor industry. Feeling called to serve the Church, he decided to leave his job and was ordained to the holy diaconate in 2005 and the holy priesthood in 2006. 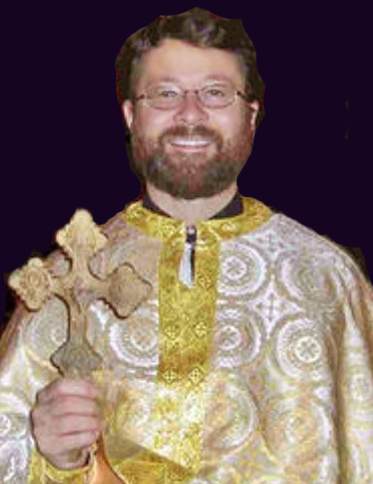 Father Calinic has served as Visiting Professor of Dogmatic Theology at St. Vladimir’s Seminary, has taught and published on Orthodox theology and spiritual life in a variety of venues. Prior to coming to St. Nicholas, he was the pastor of Holy Cross Romanian Orthodox Church.